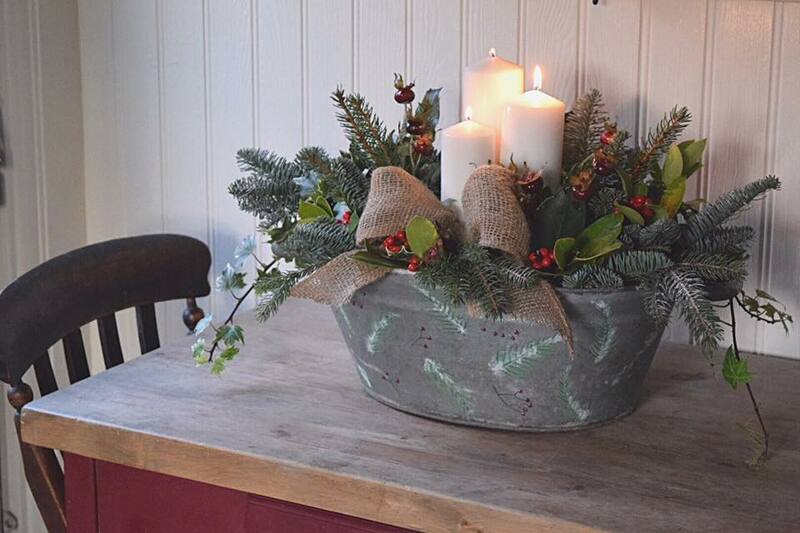 If you’re looking for a rustic twist on a classic Christmas centrepiece how about my galvanised tub reworked into a festive planter? It is super simple to create with things you already have – fresh foliage and berries from the garden, pillar candles, natural hessian, artistry brushes and paint. 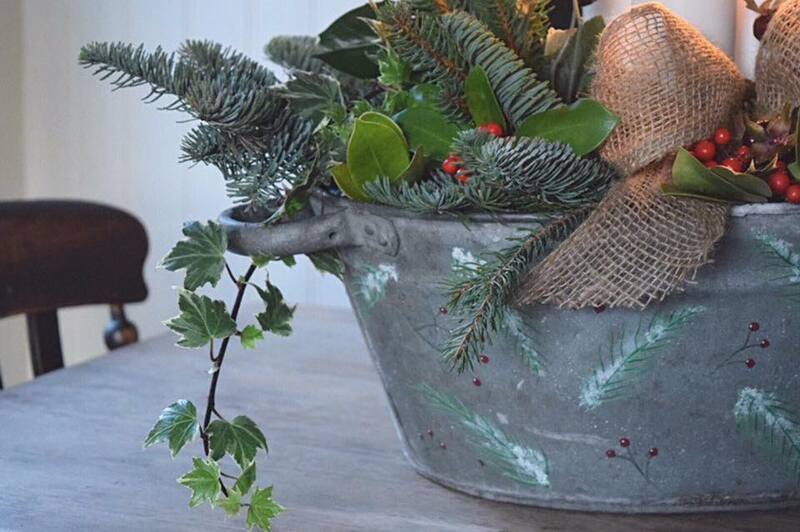 I’ve used an old vintage washtub but galvanised planters come in all different shapes and sizes. You could work this with a single candle in a standard plant pot size and create a set of 3. They make lovely dinner party gifts! 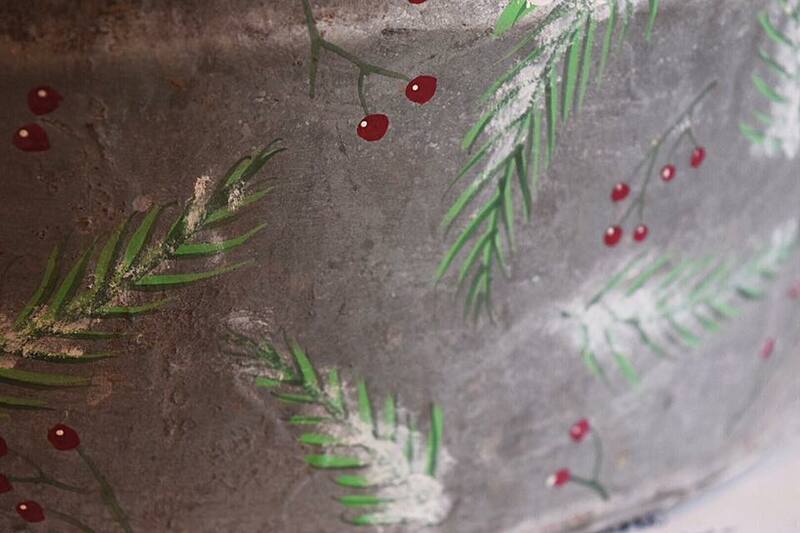 As you can see I used my trusty rigger brush to design a stylised sprig of fir foliage in Antibes Green by Annie Sloan. I love the pop of vibrant green against the silvery metal tub. For the berries I chose Burgundy by Annie Sloan. A fantastic colour for the festive season with so much warmth and depth. 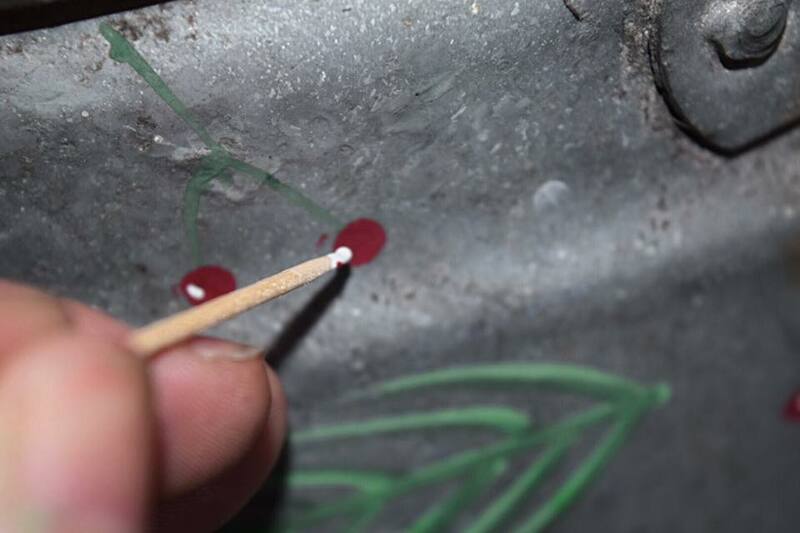 As you can see above I use a cocktail stick to create a tiny highlight with Old White to really make those berries zing and look plump and luscious. 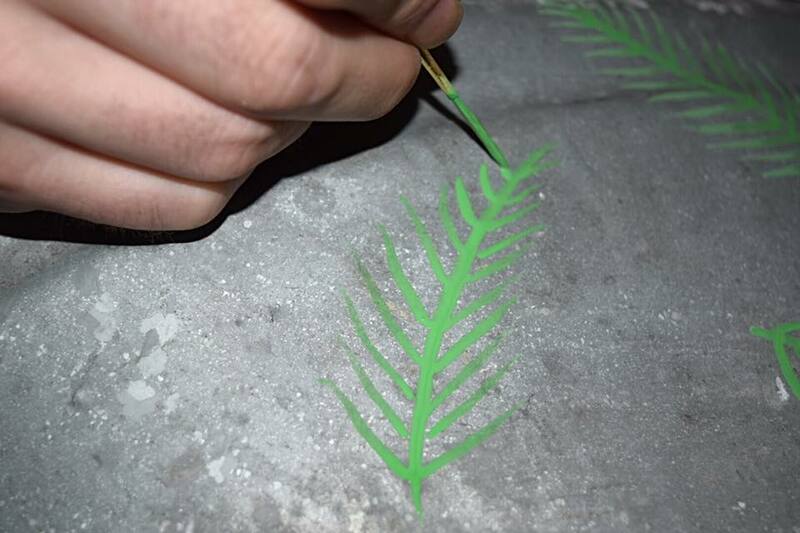 You can see above the way I created 3D depth to the foliage using Amsterdam Green by Annie Sloan, it starts to give the greenery more of an authentic spruce feel. I used the same shade for the stalks of the berries and painted all over the design to create the sense of repeat pattern viewed all around. I also used Old White for the flurries of ‘snow’ attached to each fir sprig. You can do this using a dry brush technique or dab gently with a small sea sponge and light touch to not overshadow the details. For a large piece like this you can lavishly fill it, creating the height to stagger the trio of church candles in florists’ foam. 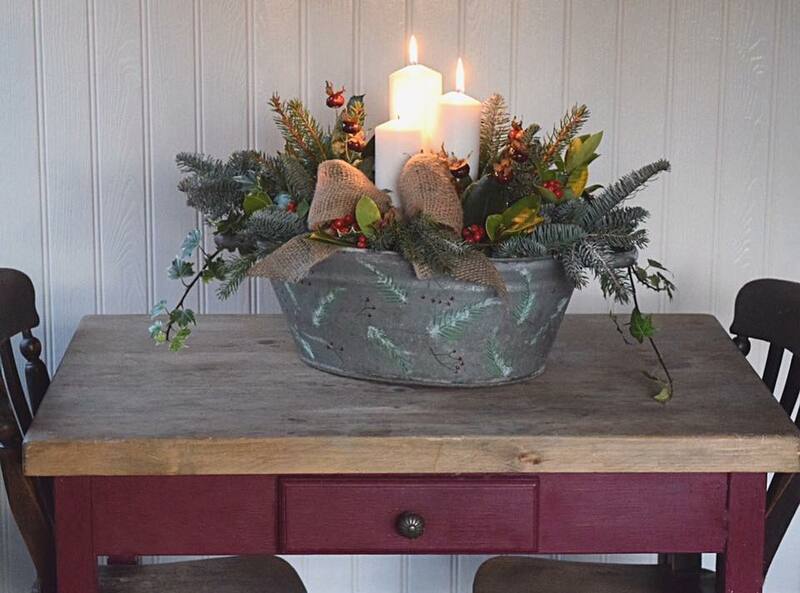 This holds them securely and then build your foliage around using spruce, ivy, holly with fresh dried or faux berries and any interesting greenery you have to hand. I’ve finished it with a simple hessian bow to the front. 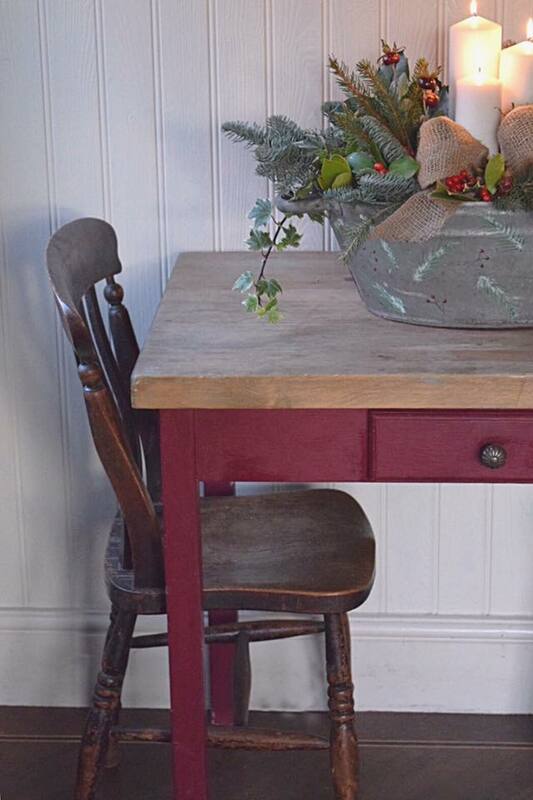 This is styled on our kitchen table with a scrubbed pine top and the base painted in Burgundy by Annie Sloan. It’s a lovely colour coordinated look that would work equally well in an entrance porch or conservatory. A big statement piece like this can bring festive decor into rooms that don’t have any. Imagine it on the floor in a simple bathroom or on a deep windowsill of a huge country house! I’d love to see some of your festive makes, so please comment below and share your projects on my Facebook page or tag me in your Instagram posts. If you’ve feeling inspired to try a little hand-painting but would like a more in-depth tutorial don’t forget to check out my Hand-Painting Masterclass, you can learn exactly how to create berries like this within a laurel wreath and easy ways to paint a monogram, as well as the actual piece of furniture. It’s over 40 minutes of HD video to watch as often as you like!